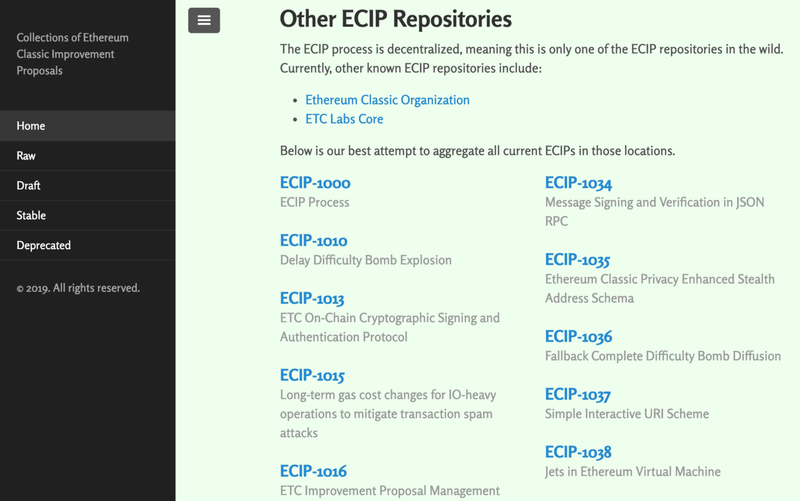 In a previous article I wrote about decentralizing the Ethereum Classic Improvement Proposal process (ECIP) using the StarIP Standard by Zach Belford and Shane Jonas, ETC core developers at ETC Labs Core, which proposes a deterministic numbering system so ECIPs can be located in different team repositories while minimizing conflicts. Then, Wei Tang, Rust developer at Parity Technologies and ETC contributor, built the 24-ECIPURI system which solves the search and discovery problem of having ECIPs in different places. Both of the above systems build upon the existing, but centralized, ECIP process which works using Github’s software versioning system. 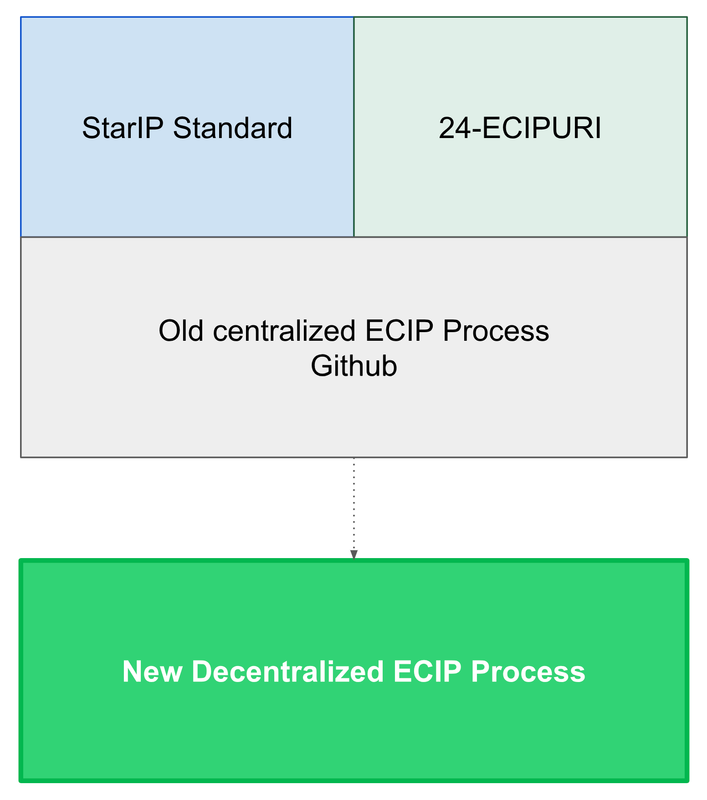 In this article I will describe how the three components mentioned above (the StarIP, 24-ECIPURI and old centralized ECIP process on Github) can be put together to serve as ETC’s new decentralized ECIP process. This compilation work was done with Zach Belford, Yaz Khoury, Tomaz Kariz and Anthony Lusardi, amongst other contributors of the ETC ecosystem. Putting together the old centralized ECIP system on Github, the StarIP Standard and the 24-ECIPURI search and discovery system. The sample preamble above, although it contains the new ECIP and version numbers, is still not finalized as it needs to contain the URIs as explained in the section below. As Wei Tang mentions in his proposal, the domain part of the specification URI acts as the specification’s registry. The “Discussion URL” will usually be the comments sections and system used on Github which supports branching, pull requests, comments, issues and merging. 24-ECIPURI includes two standard components, the “well-known” locations directory and the “authoritative specification” in the form of a specs.json document that can be hosted in an independent directory, Github or IPFS. 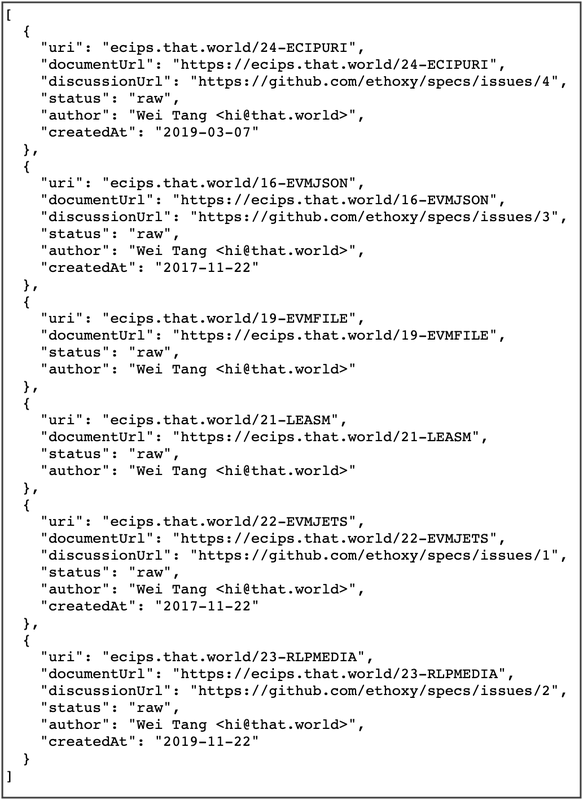 Specs.json document example from 24-ECIPURI. ECIP aggregation page at That.World by Wei Tang. Old ECIP process stays the same. With the StarIP deterministic numbering standard, ETC developer teams can now start proposals in their own Github repositories, following the same standard ECIP process as before, while other developers and ecosystem participants can still view, contribute, discuss and fork their proposals into their own repositories. When ETC developer teams finish conducting open and public discussions about ECIPs, they can signal their readiness and acceptance of proposals by merging them into their local ETC clients. Although the new decentralized ECIP process presented in this article may have some extra steps for teams when starting ECIPs to ensure discovery while minimizing numbering conflicts, the positive tradeoff is that Ethereum Classic, as an ecosystem, is replacing a centralized process with few admins, with a decentralized improvement proposal process that is much more open, therefore, more aligned with blockchain principles in general and ETC’s ethos in particular. Trust Minimization Maximalist. Immutability Samurai. Bitcoin. Ethereum Classic. Acheulean stone tools were money: SoV, MoWT, and used for counting.